Scans provide a detailed 3D image of the brain by taking multiple pictures of the inside of your head. Scans are used during diagnosis. They allow doctors to see whether there is a tumour and, if there is, its size and position. Scans are also used for monitoring during and after treatment. CT stands for Computerised Tomography. You may also sometimes hear doctors referring to CT scans as CAT scans - these are the same thing. CT scanners use x-rays to build up the 3D image of the inside of your head. They take several cross-sectional pictures through your head, then use a computer to stack these 2D picture 'slices' into a 3D image. What happens in a CT scan? Magnetic Resonance Imaging, or MRI, uses magnetic fields, rather than x-rays to build up the 3D image of your brain. MRI scanners take pictures from several angles around you head, then build these into a 3D image. MRI scans don't use radiation to produce the images. CT scans are quicker and quieter than MRI scans, and people tend to find them less claustrophobic. MRI scans usually give more detailed images than CT scans. CT scans can be used when there is metal in the body that cannot be removed. CT scans use x-rays (radiation) whilst MRI scans use magnetic fields (non-radiation.) The radiation used for CT scans is kept at a very low dose. They are used only when they are considered necessary, with the benefits outweighing the risks. CT scans of the head take around 5-10 minutes. The newest CT scanners take about 1 minute to scan the whole brain. 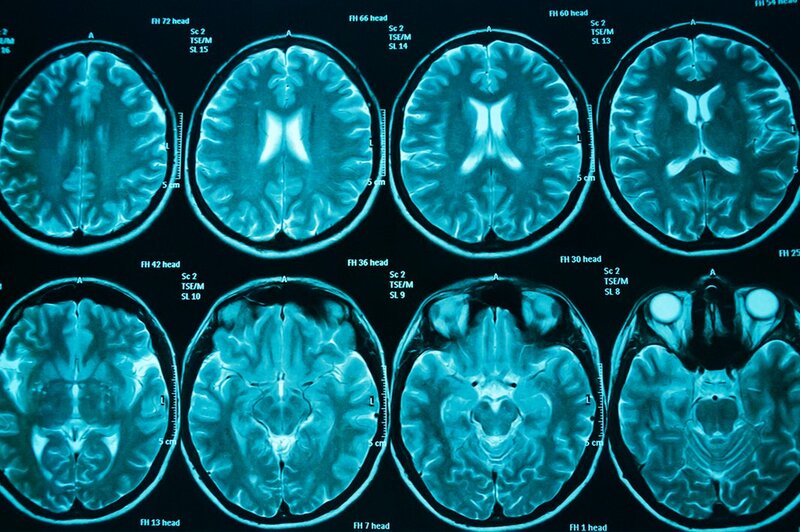 MRI scans can typically take between 15 and 90 minutes. Appointments will be longer than this as more time will be spent beforehand to get you into the correct position ready for the scan. Neither scan is better than the other. It's more a question of which scan is best suited to meet the needs of the patient. The procedure for both CT and MRI scans is very similar. These feelings are often called ‘scanxiety’ (scan anxiety). You will need to take off anything metal e.g. glasses, earrings, hairclips. If you are having an MRI scan, you will be asked if you have a pacemaker, any implants, such as a programmable shunt or skull section, or if you are likely to have any metal in your body due to working in the steel or metal industries. If you have, then an MRI may not be suitable for you as it uses magnetic fields to take images. Your radiographer will be able to tell you more. Fillings in your teeth and braces are fine, but tell your radiographer about them. You are likely to be given a 'contrast medium' (via an injection or drink) that enables a clearer image to be given from the scan. This may make you feel warm all over. Some people have reported feeling cold after having the contrast medium. the MRI scanner is more cylindrical and your head and shoulders will lie within it. During the scan, you need to lie very still. Staff will leave the room, but will be nearby. They can see and hear you, and you can hear them. You can breathe normally during the scan. for an MRI scan, this will be very loud banging and clanging noises. After the scan, you will usually be allowed to go straight home. If you have needed a sedative to calm you, the hospital staff will first check that it is safe for you to do so. You should arrange for a friend or relative to accompany you and to take you home afterwards. You should be given a time frame for receiving your test results. What other types of scan might I have? Find out more about Diagnostic Scans in the full fact sheet. Find out more about Diagnostic Scans in the full fact sheet - Clear print version, designed to RNIB guidelines.